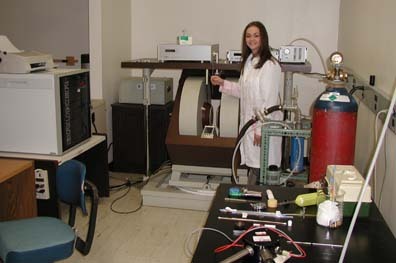 Our Electron Paramagnetic Resonance (EPR) facility was upgraded in Fall 2000. The Bruker EMX EPR spectrometer shown here is a state of the art computer interfaced instrument, which is relatively simple to operate. For low-temperature measurements, the probe can be cooled with an Oxford Cyrostat with liquid nitrogen or liquid helium. Students performing research on transition metal complexes with unpaired electrons or organic radicals find this tool invaluable in their work.